A typical yield curve chart for U.S. Treasuries (although this is the most common one, it can be for any type of bond) is a graphical representation showing the yields for each bond’s maturity. This graph usually ranges from three-months to 30 years. Plotting these yields on a graph with the y-axis (running up and down; in other words, vertically) being the yield and the x-axis (running left to right; in other words, horizontal) being the time to maturity and then connecting a specific point produces the “yield curve” for that point in time. The shape of the yield curve changes over time due to market forces and other factors such as monetary and fiscal policy. Many investors and most intelligent ones monitor the curve to gather information about future economic growth. The three types of yield curves are upward sloping, flat, and downward sloping also known as “inverted”. Listed below is the information explained by the various types of yield curves. In so-called normal or good economic times, the yield curve generally slopes upward to the right with shorter-term yields lower than longer-term yields. From purely a risk/reward viewpoint; investors should be compensated more for investing longer term periods of time. In other words, higher yields for longer maturities. When the Federal Reserve cuts interest rates to revive an economic slowdown, it forces down interest rate yields on short-term bonds so that they are lower relative to longer-maturity bonds. A growing economy may also result in higher inflation. Inflation endangers long-term bond holders since it can significantly decrease the value of bonds. Traditional bonds don’t adjust for inflation unless they are inflation-linked bonds like Treasury Inflation Protection Securities (TIPS). To entice buyers to buy long-term bonds, yields would have to increase. In either case, an upward-sloping yield curve generally means the economy is doing well or expected to do well in the future. A flat yield curve means there is very little difference between short-term yields and longer-term yields. In other words, investors essentially receive about the same interest rate whether they purchase a two-year bond or a 30-year bond. Why would an investor invest in a long-term bond with the same yield as a two-year bond? One of the reasons could be the Federal Reserve would increase short-term interest rates in an attempt to slow the economy and keep inflation in check. As a result, if enough investors believe that the economy is going to slow down substantially, many will invest in higher yields of longer-term U.S. Treasuries. Such a so-called rush into U.S. Treasuries could accelerate this “Flattening” effect as investor demand increases for longer-term bonds. Therefore, interest rates decrease. Another important point to make about a flat yield curve is that it does not mean that, economically speaking, that we are about to fall off the recession cliff. The graph at the end of this article indicates the difference between the two-year and 10-year U.S. Treasuries. Whenever the spread is negative [the yield on the two-year U.S. Treasury Bond exceeds the 10-year U.S. Treasury Bond, we will soon have a gray bar (The gray bar indicates a recession.)]. In normal times, 10-year U.S. Treasury yields exceed two-year U.S. Treasury yields. This means the U.S. economy is starting the recovery process or has recovered. It also should be noted that the spread can be narrow (flatter curve) for some time without a recession. 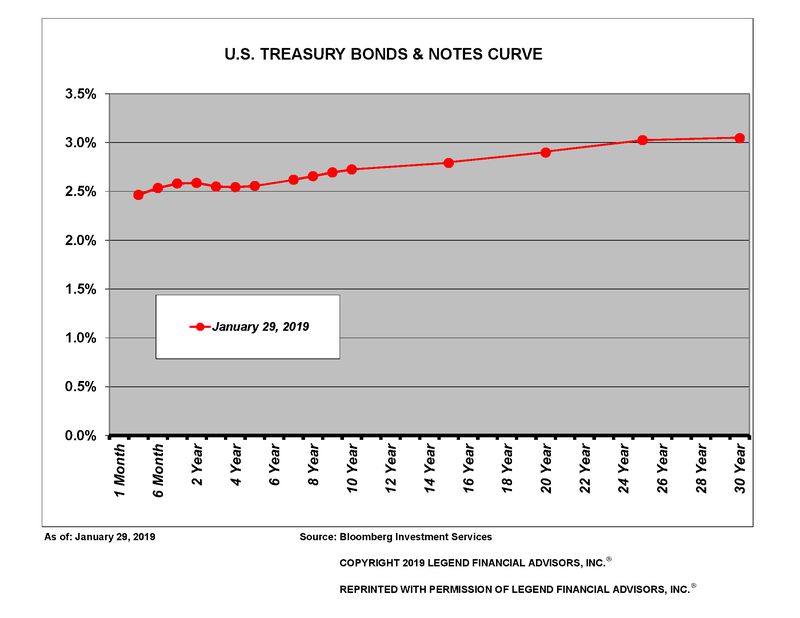 Referring again to the graph at the end of the article, the yield curve is considered inverted if the spread drops below zero, meaning the yield on the two-year Treasury is greater than the yield on the 10-year Treasury. Currently, the yield curve for U.S. Treasuries is upward-sloping (considered a “normal” yield curve) as the economy continues to grow. Short-term interest rates will eventually rise. However, the longer interest rate end of the yield curve can be, and usually are, influenced by investors’ expectations about economic growth. Given the history of interest rates and the corresponding yield curve, investors should always monitor interest rates for signs of trouble or opportunities.